Charles Sequoia Crosswhite is an enrolled member of the Cheyenne River Sioux Tribe, and a descendent of Chief War Eagle and Chief Swift Cloud. He is an accomplished musician, grass dancer and historian, and his handmade flutes and musical recordings uphold the traditions of his Lakota ancestors. Much of his music is a fusion of hip-hop, rock, and lyrics about Indian heritage and contemporary life. 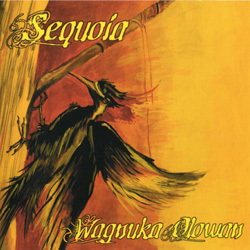 Wagnuka Olowan (Woodpecker Song), his first album, highlights the Native American flute and it's connection with nature, and is a mix of contemporary and traditional sounds. Sequoia is also a tour guide, whose trips include historic and traditional stories along with flute and traditional songs. Please contact us for more details. Click tracks to play mp3 samples.